The other day we took young Emi up to the Dalí museum in Figueres. He's only nine, but I thought he might get a kick out of the way the great Surrealist Master liked to depict the world around him. 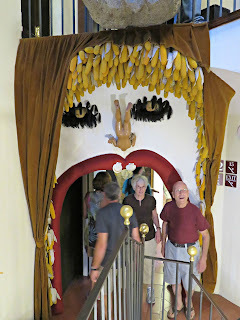 I'd expected young Emi to find Dalí fun, and he did, but he also found some of his work deeply creepy (his exact words). He loved the funky museum, however, without any qualification. It's a great big boisterous building that poses all sorts of questions with its design elements that are guaranteed to have you wondering what Dalí was on about. In short, the museum in Figueres is as much a work of art as anything that it houses. Its ... well, it's like no other building I've ever visited. 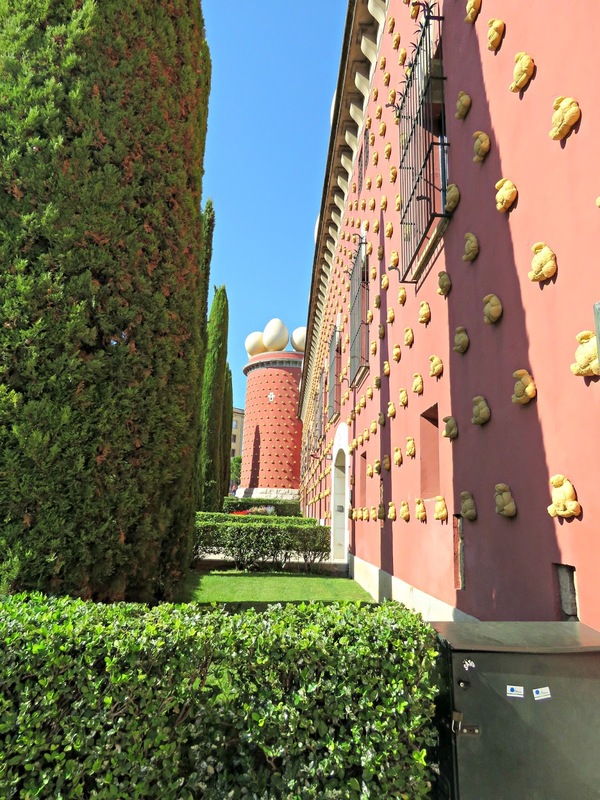 It's been painted a deep terracotta, which has been adorned with loaves of golden bread. 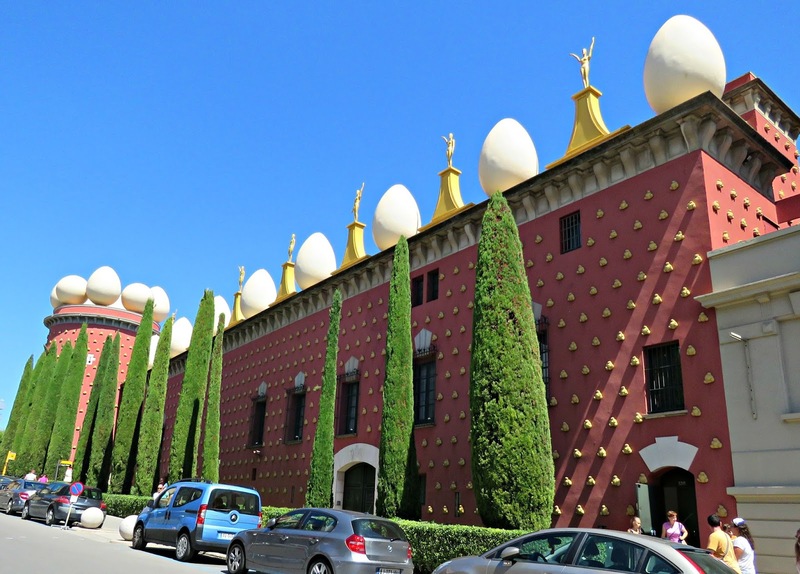 On top the roofline is crenelated with eggs. 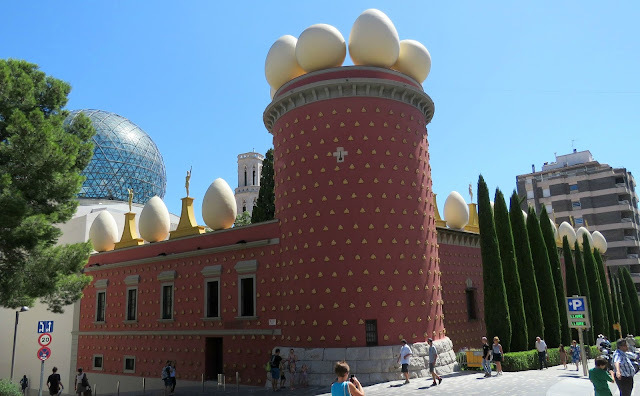 It looks vaguely like a castle, but, hey, would you want to hide behind a giant egg shell if you came under attack? No, me neither. 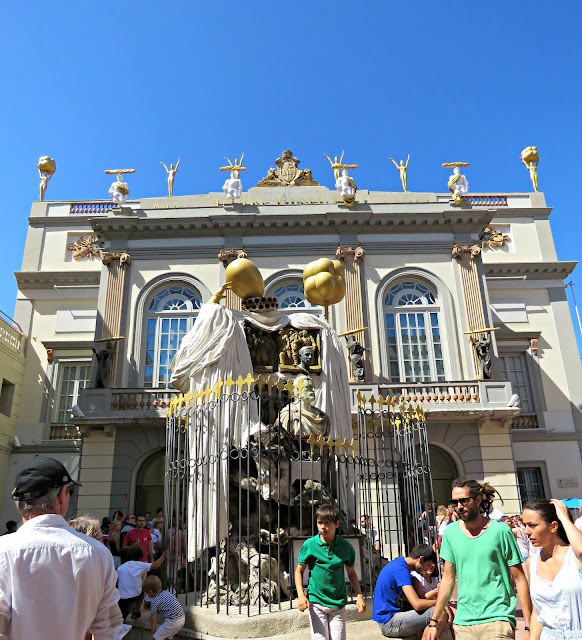 And between the eggs are mannequins, gilded and svelte, each of whom seems to stand in a different pose. To my untutored eye they bear an uncanny resemblance to that little gilded statute that means so much in the film world and goes by the name of Oscar. 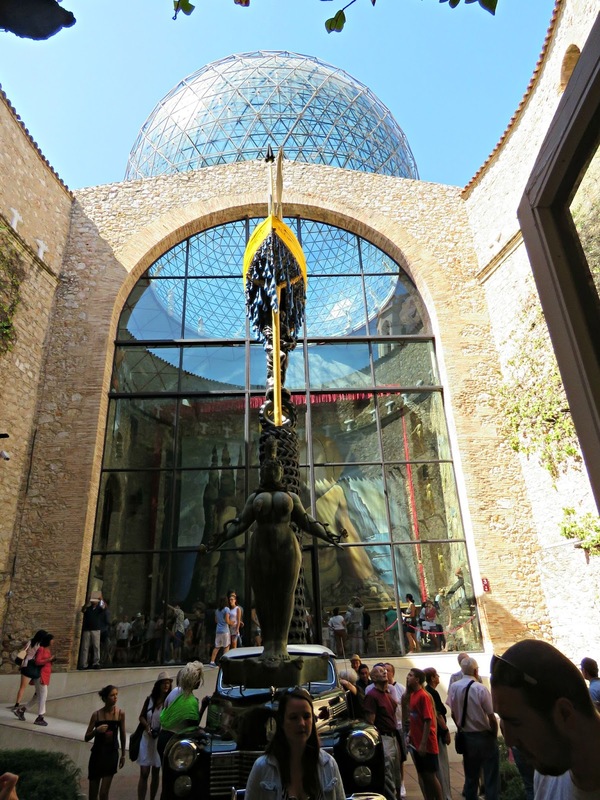 And in a way that makes total sense, because this museum used to be a theatre, and Dalí was nothing if not theatrical. He was, in my view, the greatest showman of the 20th century, and if he'd directed his talents into the medium of surrealist film-making, his efforts would probably have won him an Oscar for real. On the night of 19th February, 1939 the old theatre was destroyed by accident by a group of Franco's Moroccan recruits. As was the case with many other buildings that suffered a similar fate during the Civil War, it was left to stand in ruins during the post-war years. 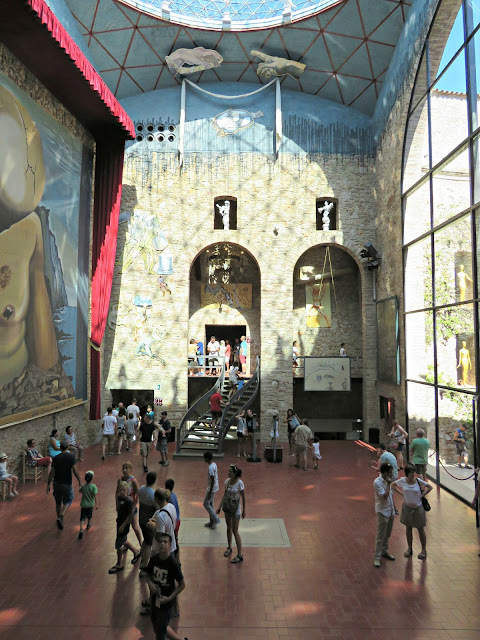 But Dalí, who was born in Figueres, and had been baptised in the ancient Church of Sant Pere next door had his eye on it. As his reputation grew and his genius became acknowledged the world over it seemed only fitting that he should have a showcase, a museum dedicated to his oeuvre. 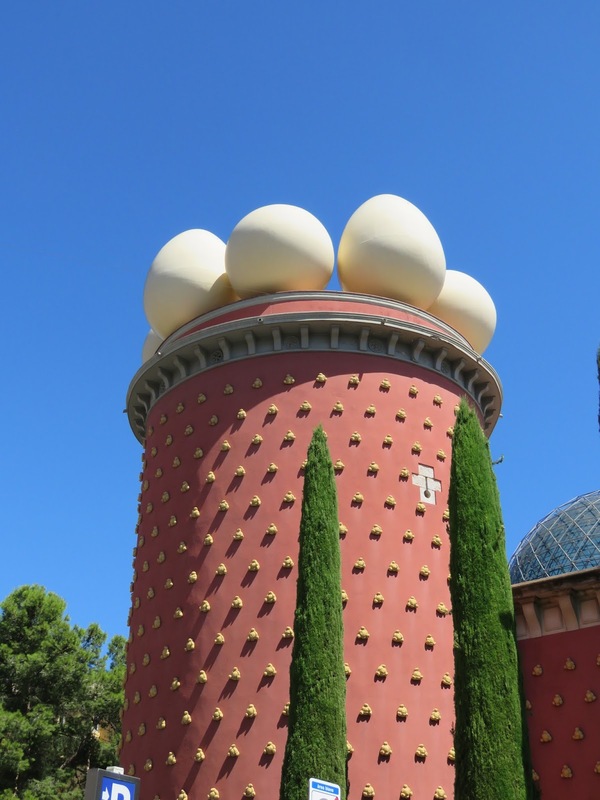 And Dalí, being a faithful son of Figueres, could think of nowhere better to open his museum than in the town he called home. In 1961 the town mayor accepted Dalí's offer to convert the old theatre into a museum to showcase his art. Work began under the watchful eye of the master who moved into an apartment in the Galatea Tower with his beloved wife and muse, Gala. 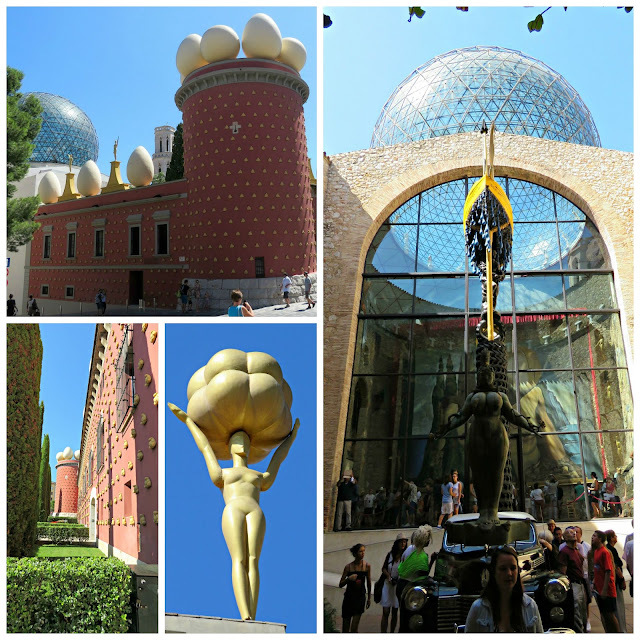 They tell me that Dalí was obsessed with queues. He loved queues - especially those that formed outside of galleries where his work was being displayed. The day that we visited the museum it was crazy busy. 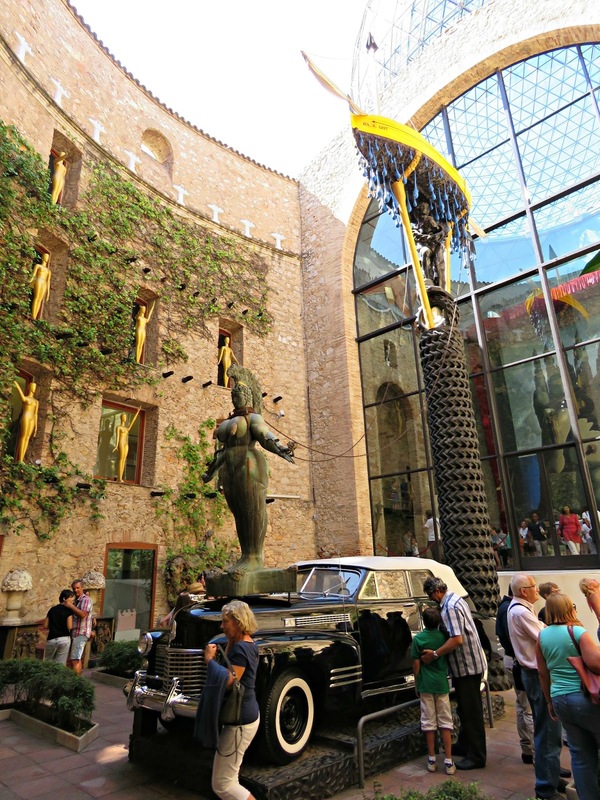 It is most days: this is the most-visited gallery/ museum in all of Catalonia, and that appears to have been something that our old friend, Dalí, had anticipated. He planned for the ticket queue to be contained in the Plaça Gala-Salvador Dalí, and this is where he sets out his stall for us. In the way that a market-trader displays his merchandise Dalí makes a visual statement of what he is all about in this space. He's getting the crowds, who are queuing for tickets, warmed up for immersion in his surrealist view of life. Normally I hate queues, to the point where I am frequently put-off doing things because I can't bear the misery of queueing for however long it's going to take to get in. 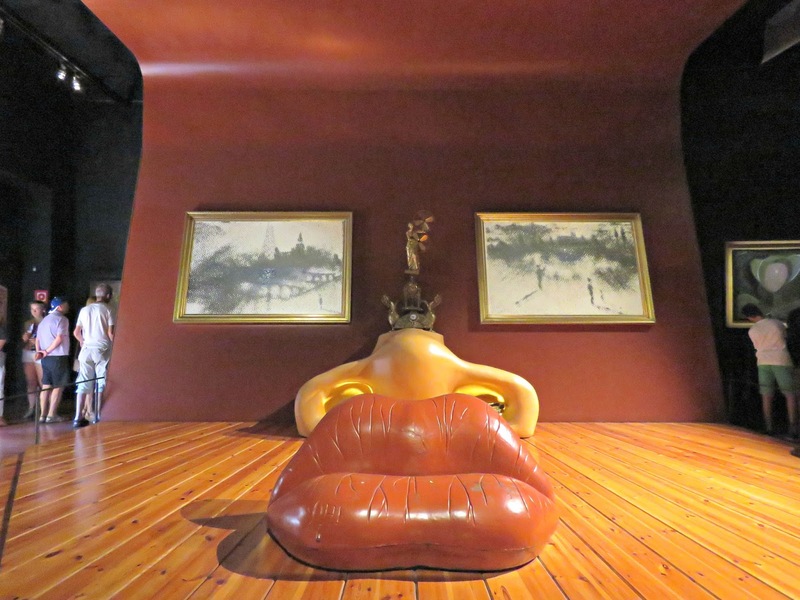 But Dalí had thought about people like me, and put all this stuff outside to keep us entertained and get us into a receptive frame of mind for what lay within. Instead of getting grumpy about how long it was taking to get through the door ... would it never be our turn ... 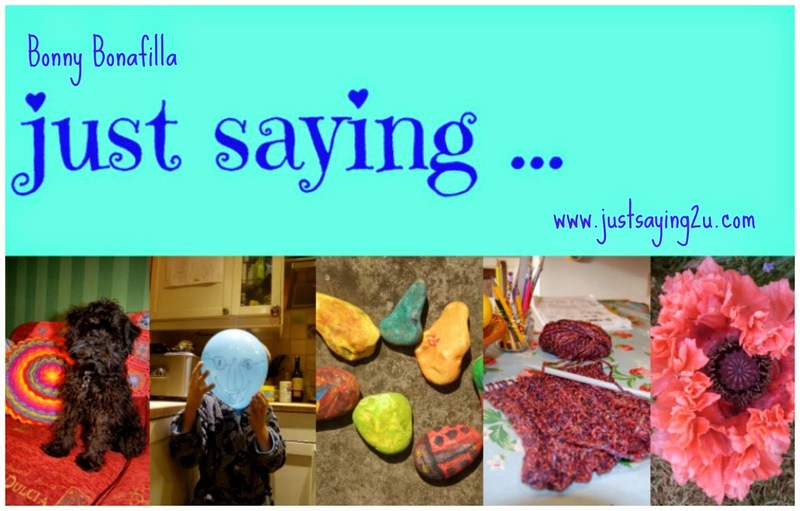 I found myself growing more and more intrigued by the objects he'd left out for me to look at. Right in front of the door he placed a monument in homage to Francesc Pujols, a famous Catalan philosopher, and a family friend, whose thinking Dalí is known to have admired. In a playful touch he displays the composite figure in the contemplative pose of Rodin's Thinker. He's got a huge gilded egg for a head, and just over his left shoulder sits a gilded hydrogen atom. Much as Dalí admired Pujols' philosophy he also wanted to tell us about his interest in science. 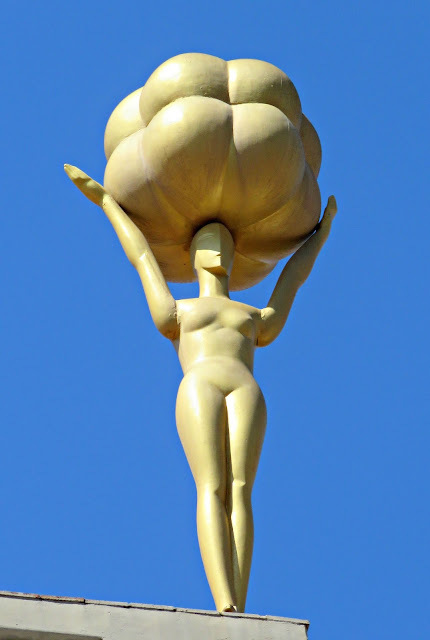 This gilded hydrogen atom is one of Dalí's recurring motifs. It also appears on the facade of the museum, where it is held aloft by some of the gilded mannequins. This monument also highlights his interest in antiquity. The composite figure is draped in a Roman toga and a bust of a Roman Patrician, on top of which a bronze head of Pujols balances precariously is also included. And the whole ensemble sits on top of the gnarled bough of an ancient olive tree, signalling to us Dalí's interest in the past and his roots here in Figueres. 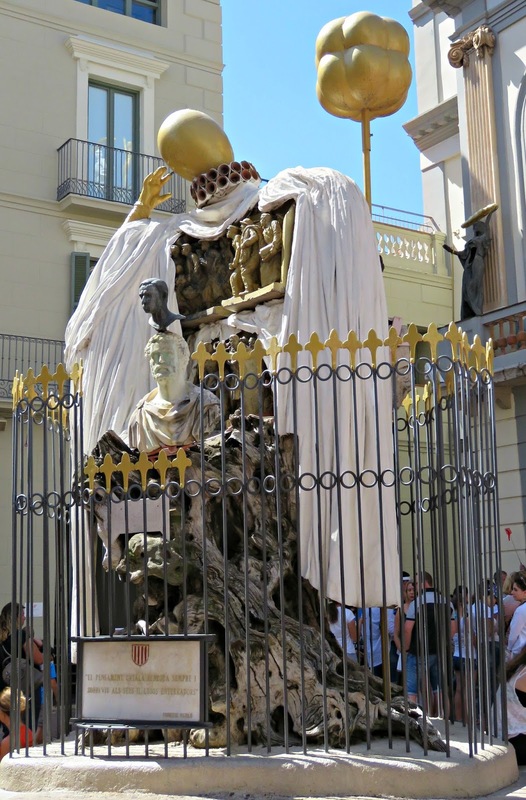 Dotted around the Plaça Gala-Salvador Dalí are three statues of the French master, Jean Louis Ernest Meissonier, a painter whom Dalí greatly admired. 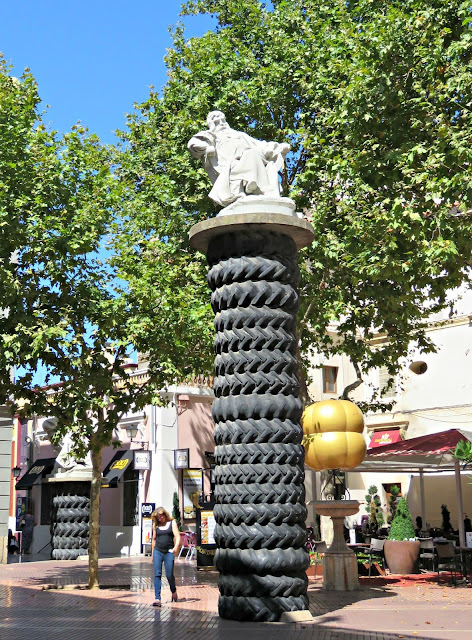 I'm not entirely sure what was going on with the tractor tyres. The figure of a deep sea diver complete with his heavy helmet and diving suit on the front facade warns us to get ready for full immersion when we enter the building. Once inside we made our way into the central courtyard that used to be where they had the stalls in the old theatre. I've got to say that I totally love this space. It's just so wacky and it works from so many different angles. There's an old Cadillac parked in the centre. You can see Emi and Mr B taking a gander inside in the photo below. It's called the Rainy Taxi and the strange thing is that the rain is on the inside where a small population of Burgundy snails happily share the journey with the cabby's passengers. In this space I love the way the geodesic dome looks like a sphere that seems to be balanced on top of the old stage area. From this angle it's such a great visual illusion. 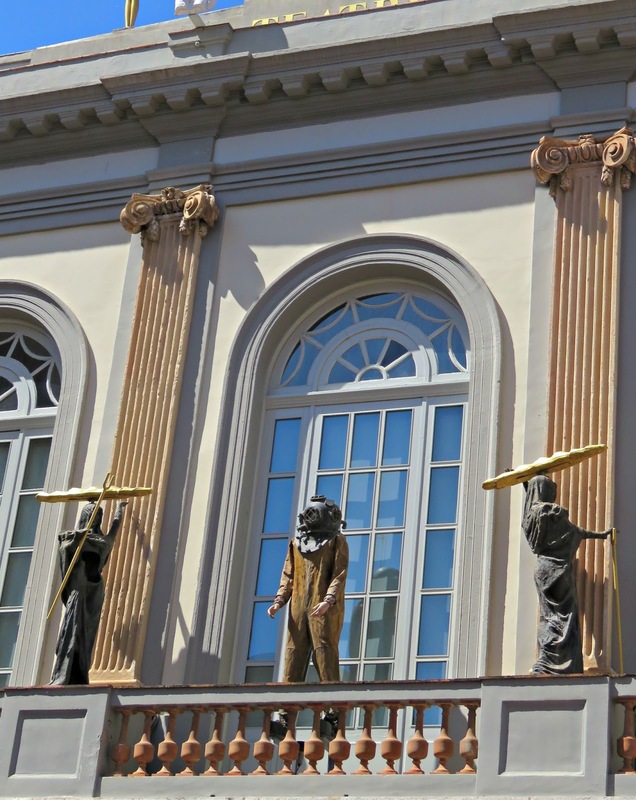 I also love the way in which the classical-looking statuary turns out to be a concoction of the old and the new. 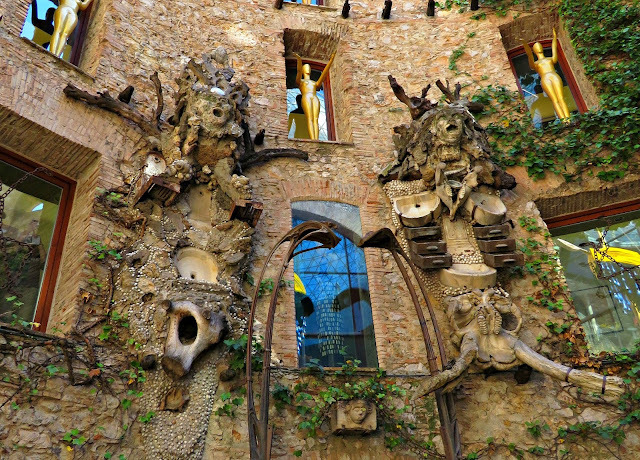 Just look at all those sinks and desk drawers that have been piled up to support the faces of the grotesques above. 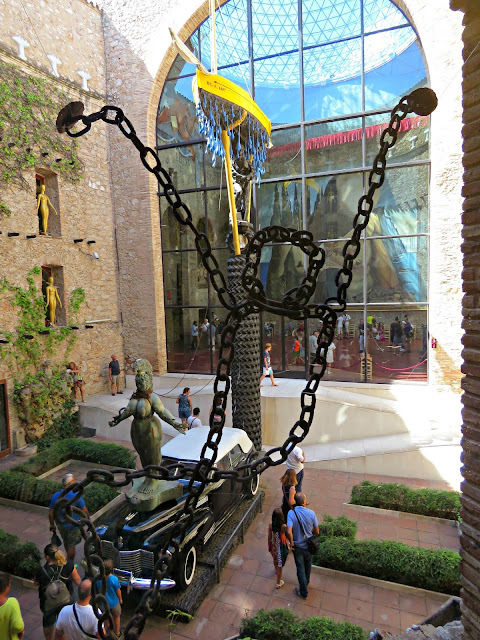 And when you go inside to look at the art in the galleries that run around the courtyard you also get some great views down into this central atrium. 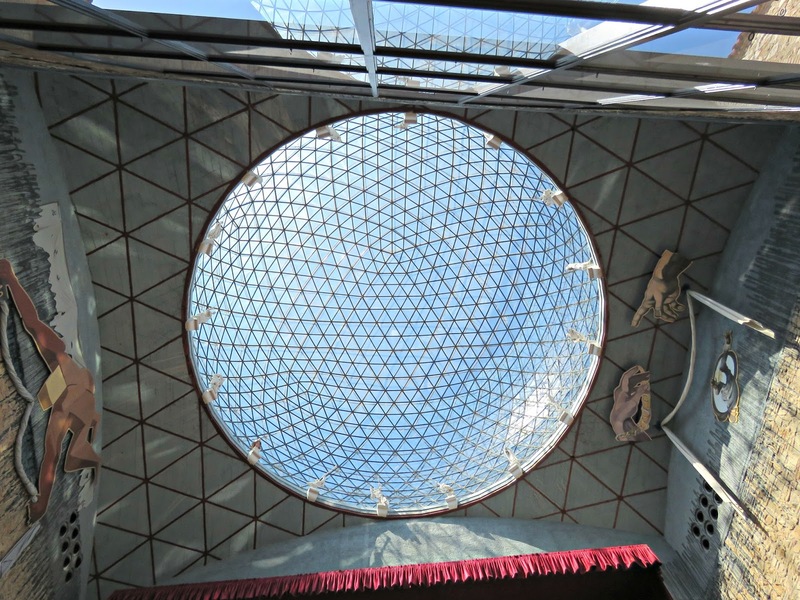 And this is what that great glass dome looks like from below. 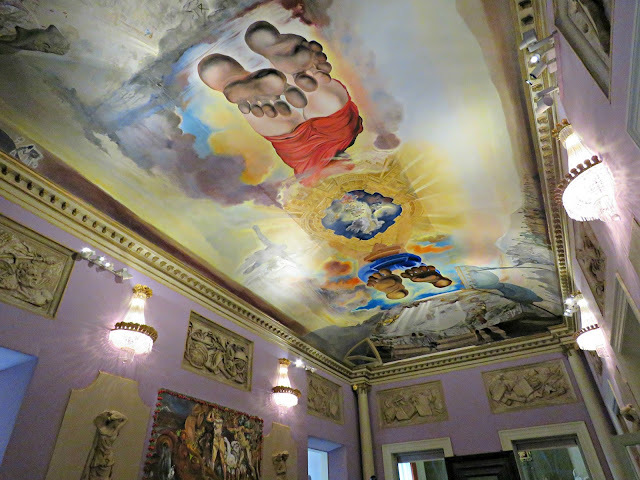 In this space Dalí has thrown in a few references to the roof of the Sistine Chapel - just look at his cartoon cut-out of the hand of God touching the hand of man. It's wonderfully tongue-in-cheek, sort of like he's taking the Mickey out of his own aspirations for this space. Even in death Dali couldn't bear to leave the museum. A discrete tombstone in the middle of the stage marks the location of the crypt in which he was buried on his death. 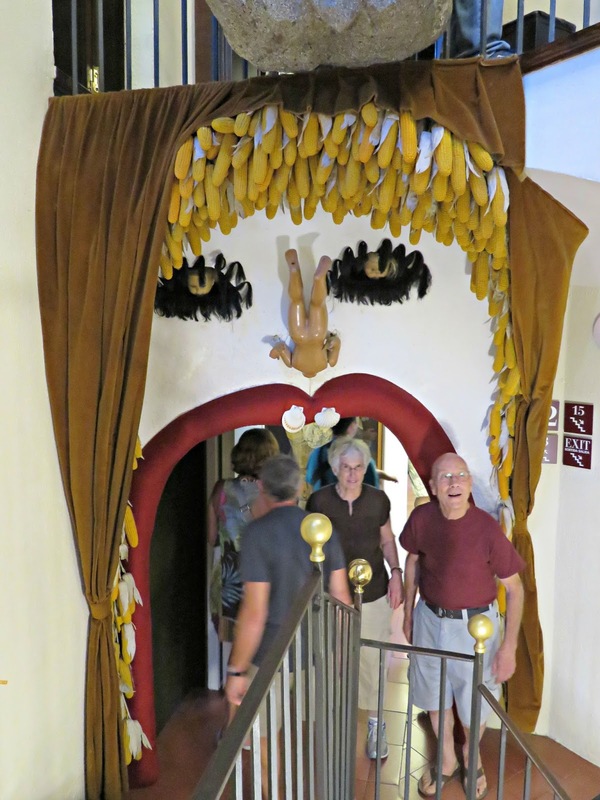 Upstairs there's an apartment with this surreal bedroom. 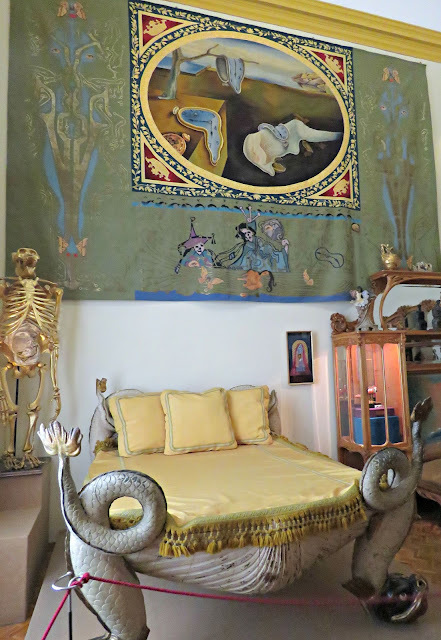 The crazy-looking bed has been taken from a legendary Paris brothel, Le Chabanais, where it is rumoured to have belonged to La Castiglioni, one of Napoleon III's favourite mistresses. I've often wished that inanimate objects could tell me their stories. Just imagine what a tale this bed could tell ... . La Castiglioni was a member of the minor Italian aristocracy. On being sent to plead their cause with the Emperor in Paris she appears to have seduced him. I guess it would've been difficult for her to have been any more persuasive than that. A voluptuous beauty she was known for her elaborate outfits and flamboyant entrances. She was also an early enthusiast of the new-fangled art of photography. I think she and Dalí would have got along famously. What do you think? Also in this apartment is the Palace of the Wind chamber. It must have been intended as another piece of irony. The thing is that people here suffer from the Tramontana, the North Wind, which whistles over the Pyrenees to create havoc in the region of Upper Empordà. When it crosses the snow-covered mountains it inflicts a special sort of torture on the folk who live within its influence, and they say that both the suicide rate and the murder rate rise dramatically when it blows. In another apartment you can check out the Mae West room. When you climb a set of specially positioned stairs to look through a lens you see the view framed by a huge wig, and it looks like the famous actress Mae West. Emi and Mr B enthusiastically queued up to see blonde bombshell, but I'd done quite enough standing in line for one day and gave it a pass. 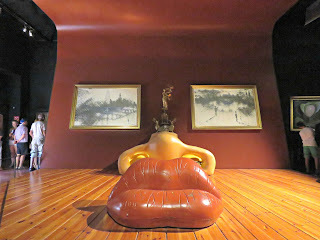 And also watch out for this lady who also boasts a pair of voluptuous lips. As you can see the fabric of the museum has been carefully considered and thought through. Nothing here is random or has been left to chance. It's all been carefully planned by the Master with a view to entertaining, delighting and challenging us in equal measure. If you'd like to go and see it for yourself you can find the website here: Dalí Theatre Museum.